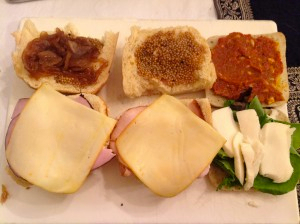 So, tonight I employed one of the simplest but best applications of the products–paninis! Simply find your favorite bread, meat and cheese and add our products to take them from ordinary to gourmet. I chose turkey, muenster, TE mustard seeds and TE onions for our first panini. The second was a very basic focaccia with arugula, buffalo mozzarella and TE roasted eggplant and red pepper spread. The third, I chose Black Forest ham with provolone, TE fig chutney and mustard seeds. 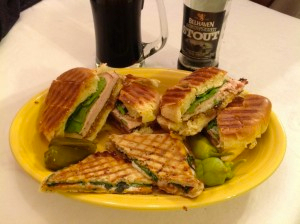 Five minutes in the panini press and done, dinner! 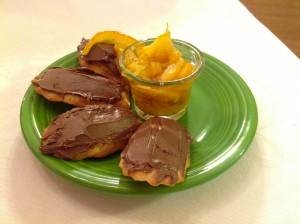 For a simple dessert, I bought Madelines, spread them with Nutella and topped them with TE candied oranges. It took all of five minutes to do and it was delicious. One of our primary goals when developing these products was to provide our customers with simple solutions to gourmet meals. I feel like we accomplished this…do you?